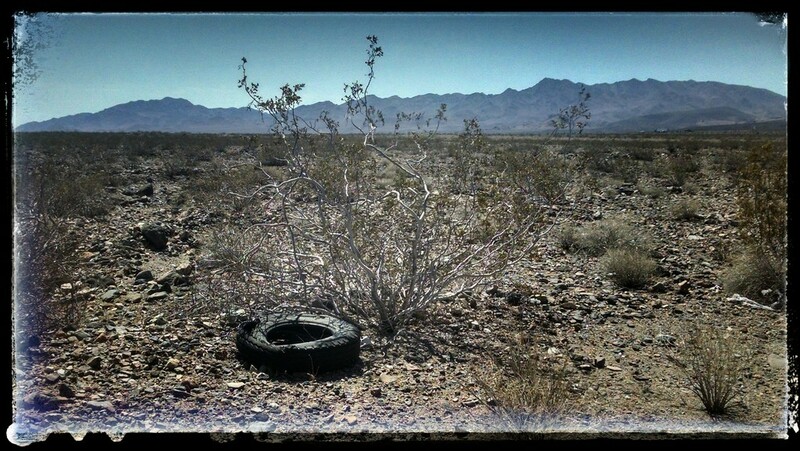 This is a sad sight, the blight of the Mojave in southern California - JUNK! The desert is actually a very delicate environment. Harsh temperatures and very low rainfall but a stark and very peaceful beauty can be found. I hate to see trash just left wherever. That tire adds so mch to the shot! It is very sad to see litter just scattered about a landscape like this. But you have captured it beautifully. The sharp contrast really adds to the bleakness of it. Very sad sight indeed but it made for a very good photo with the descriptive word. I also like your framing of choice. A very evocative image and well described. could have been taken here. @susale The desert is actually a rather interesting place. A bit hot this time of year but so many weird things out there. @graemestevens Thank you. The desert is Zen in a strange way. @megpicatilly It seems some people have no real respect for nature. I guess they might feel like who cares if 'I' just trash an unused place. @sdutoit Thank you, glad that there wasn't too much other garbage there. @brett101 It did, didn't it. So maybe I got lucky? @maskerade Thank you, I am kinda passionate about stupid lazy people. @kali66 True, hadn't thought about that. @chard Maybe but it has been there awhile. @frappa77 Thank you so much. @francoise Thank you, the average June temperature in Daggett is about 100 but as they say, it's a dry heat. In my book, hot is hot! Nice shot. This is a very familiar site where I live - dumped tyres and no end of household appliances along with burned out cars and motorbikes. The latter are usually ones that have been stolen first. The things I see around the park are just awful.. and it makes me mad too.. I wouldn't expect to see a tyre in the desert though.. I guess the people got a flat and just dumped it. I tried looking at your link but it doesn't seem to recognise it.